I’m a bit late in posting the March 2009 Daring Bakers challenge. I made it with plenty of time to spare, but have been very busy with company this week (more about that in the days to come) and haven’t had a chance to write up a post until now. The March 2009 challenge is hosted by Mary of Beans and Caviar, Melinda of Melbourne Larder and Enza of Io Da Grande. 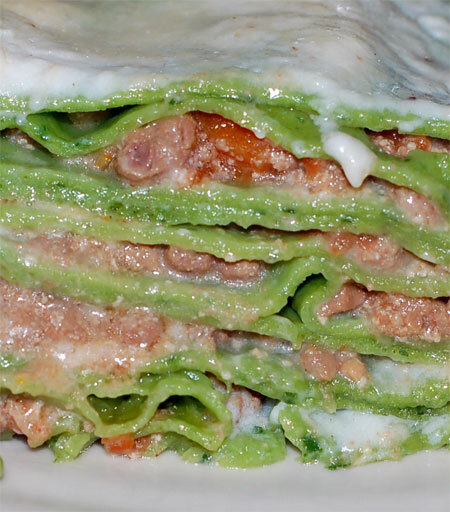 They have chosen Lasagne of Emilia-Romagna from The Splendid Table by Lynne Rossetto Kasper as the challenge. 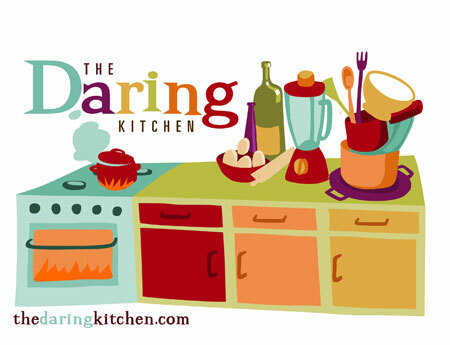 I was a little surprised by this choice of recipes, as it didn’t feel so much like a baking challenge as a cooking one to me, but maybe it is connected with the upcoming launch of the Daring Cooks. I’m not complaining—I will take any excuse to make good Italian food, and for that matter, the cannelloni I made last month for Valentine’s Day had a very similar construction. 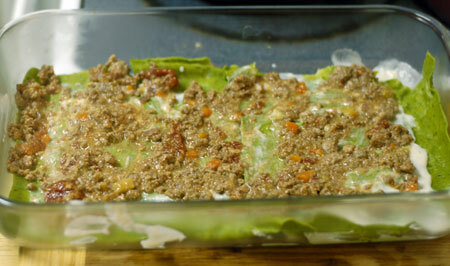 I actually have some leftover ragu bolognese in the freezer from that meal that I had been planning to turn into lasagne with homemade spinach pasta, oddly enough, but in the spirit of the challenge, I made up a fresh batch following the recipe provided. 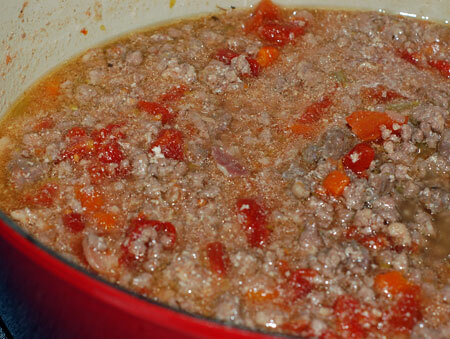 The first step for making the ragu was tracking down the meats called for. I had to make a few compromises in this department due to availability: I purchased a small chuck pot roast, some veal scalloppine, and a mild Italian sausage, plus prosciutto and sliced pancetta. The chuck, veal and prosciutto went through my trusty grinder while the pancetta and mirepoix sauteed, and soon enough I had a pot of ragu percolating slowly on the stove. When the ragu was nearly done, I set to work on the pasta. I make quite a bit of fresh pasta, but with several hours already invested into this meal, I decided against kneading and rolling out this pasta by hand. 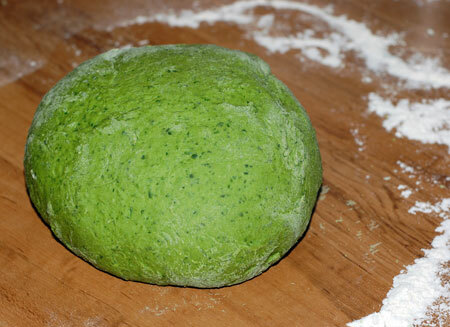 I used fresh baby spinach and chopped it up in my food processor before mixing into the dough. With two extra-large eggs, the dough was much too dry to come together, so I added a third egg and had to compensate with quite a bit of extra flour as well. I mixed it up in my stand mixer, but did a bit of hand-kneading near the end to ensure the correct consistency. The color was astonishingly beautiful, perfect for early spring. 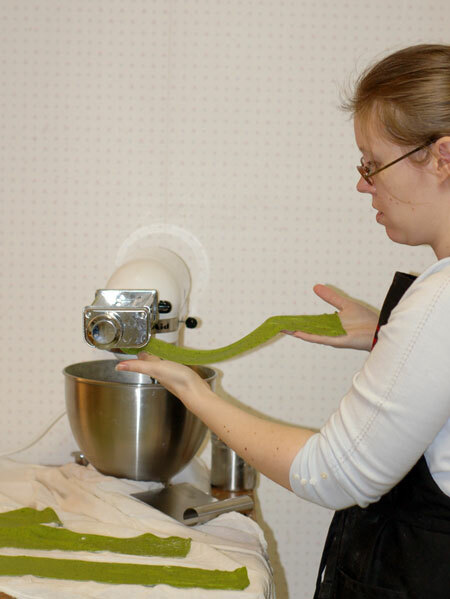 Once the dough had an opportunity to rest, I divided it up and ran it through my pasta roller—over and over again. I rolled it as thinly as possible, which turned out to be setting 5 of 8, as it tended to tear when I went up to a 6. I think the little bits of spinach in the dough were to blame there. Whenever I make pasta, I wish I had a drying rack or even more counter-space for draping the rolled sheets. I rolled pasta and boiled it all at once to save a bit of time, but it makes for quite the juggling act. I cooked a few sheets at a time, with a colander set in a large bowl next to the stove. While they cook, I roll out the next batch; then I scoop out the cooked pasta into the bowl-nested colander with a spider, quickly fill the bowl with cold water at the sink, drop the next batch of pasta in the hot water, drain the cooked pasta and lay it out on towels, and roll the next few noodles. I tried having an ice bath ready and leaving the noodles in it for a longer time while rolling and cooking more, but I found that the water warmed up too much from the heat of the pasta, and I ended up with squishy noodles that tore if I just breathed too hard on them. I think I got at least 6 or 7 layers into my casserole dish. It took much more Parmesan than the recipe called for, but I used all the bechamel and had a cup or two of ragu leftover. And I had a ton of extra pasta, which may have in part been because of the additional egg and flour I ended up using. I cooked off all the pasta and used it a few days later to make another dish, which I’ll post about soon. The finished lasagna was absolutely delicious. We’re so used to lasagnas that are laden down with ricotta and gooey mozzarella cheese—you eat a piece and as tasty as it might be, it sits like a lump in your stomach. 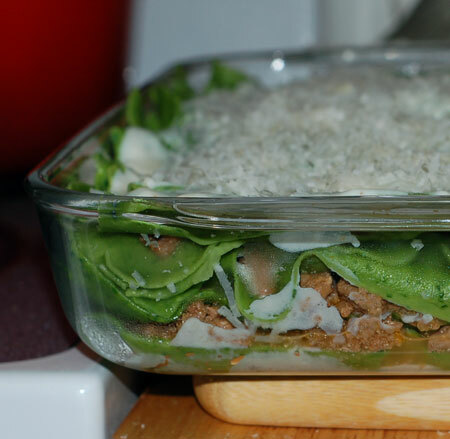 This lasagna felt so light in comparison, but it packed a big punch of flavor. It took most of the day to make, but I was lucky enough to have my mom visiting us and she patiently kept the baby entertained while I worked. If not for her, I would definitely have had to split this recipe up over two days to save my sanity. I won’t be making it again anytime soon, but I’m very glad to have tried it, so many thanks to our hosts for their unusual choice. 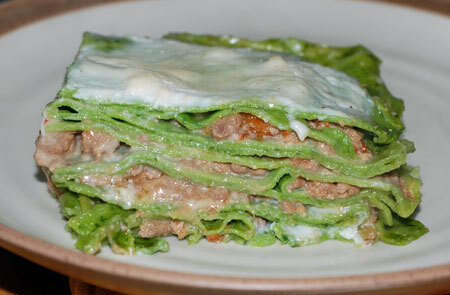 Be sure to look through the Daring Bakers blogroll to see all the other lovingly crafted lasagnas out there. Great photos and your pasta turned out gorgeous, as did your lasagne! YUM! Wow, nicely done – your pasta looks so delicately layered; lovely!! Lovely lasagna. Thanks for all the cooking tips. Your pasta is perfect–wish I could have gotten mine that thin. Great job! Your lasagna turned out lovely! Your lasagna looks great! 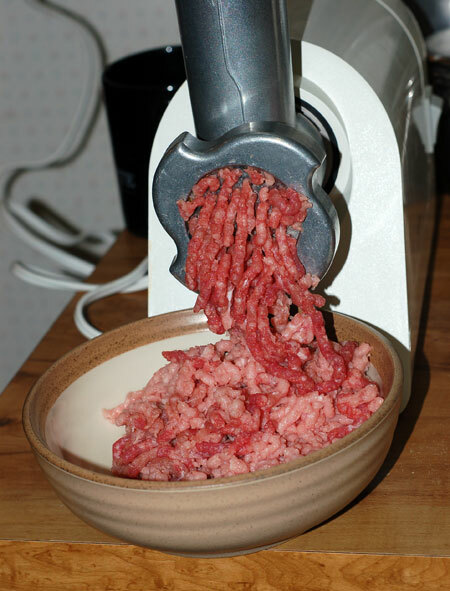 I am jealous of your meat grinder and pasta roller, I had to buy ground meat and roll my pasta by hand. Your photos look awesome as well! What a great job on this challenge and the photos are so good. 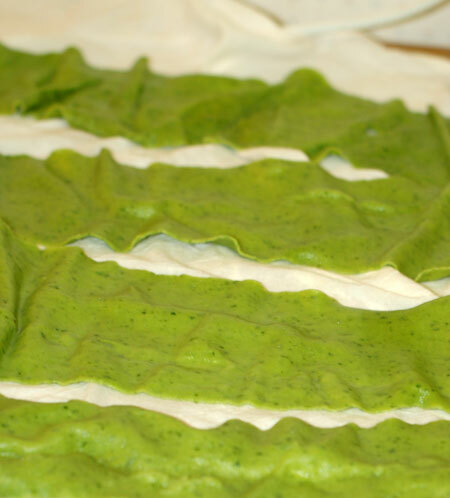 I just loved this recipe and will never go back to dried pasta.